The thieves may be able to follow the design plans and produce a loom. But we are modifying and improving our looms every day. Before you say you can't do something, try it. 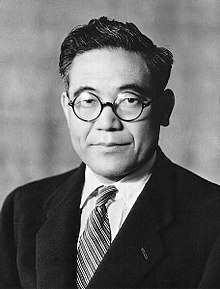 Kiichiro Toyoda (豊田 喜一郎, June 11, 1894 – March 27, 1952) was a Japanese entrepreneur and the son of Toyoda Loom Works founder Sakichi Toyoda. His decision to take Toyoda Loom Works into automobile manufacturing created what would become Toyota Motor Corporation. [The Japanese auto industry should] catch up with America in three years. Otherwise the Japanese auto industry will never stand on its own. My father served the State by investing a weaving machine. He told me to make automobiles. It is difficult to create an automobile industry. Comment by Kiichiro Toyoda at the preview of the first Toyota vehicles ever rolled out of the assembly line. The thieves may be able to follow the design plans and produce a loom. But we are modifying and improving our looms every day. They do not have the expertise gained from the failures it took to produce the original. We need not be concerned. We need only continue as always, making our improvements. Kiichiro Toyoda in The Toyota Way, 2001: Quoted in: "Toyota quotes," New York Times, Feb. 10, 2008. Comment by Kiichiro Toyoda after thieves had stolen the plans for a new loom from his father's workshop. Japan has a lot of engineers who work at desks. When it comes to implementation, though, they lose confidence and haven't got the courage of their convictions when other people criticize them. Engineers like that can't build cars. Success in this industry demands engineers who have the courage and the decisiveness to implement ideas. Forbes.com readers and editors rank Sakichi Toyoda as the 13th most influential businessman of all time... Sakichi Toyoda was a weaver who, in 1924, invented a loom that would detect an error and automatically cease production, preventing the creation of defective goods. He later sold the patent on his machine to a British firm for about $150,000. That money was used to help his son found a start-up, Toyota , which would become the world’s second-biggest carmaker. "Sakichi Toyoda (1867-1930)," at forbes.com, 7/13/2005. Toyoda Kiichiro was the founder of the Toyota Motor Company in 1937. His short career with the firm was enough to lay the foundations for its successful later growth into one of the giants of the car industry worldwide. In particular, Toyoda introduced two of the most important elements in what later became known as the Toyota Production System: just-in-time production and kaizen or continuous improvement. His influence on production and supply chain management in the years since his death has been immense; probably no other manager since Henry Ford has so revolutionised the concepts and processes of manufacturing management. This page was last edited on 7 September 2018, at 15:05.